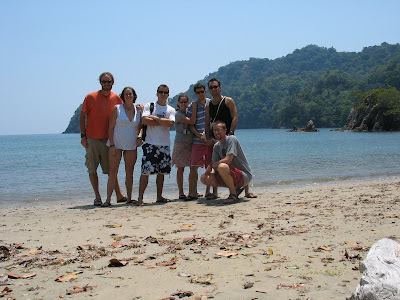 This is my Blog about my experiences as a Peace Corps Volunteer in Honduras, and my life afterword. Well, I made it back. Em and I had a very quick road trip across most of the northern states to arrive safely in Pullman, Washington a couple of weeks ago. I don’t know if anyone is still reading this but I’ll try and update it once in awhile. Right now I’m working and attending graduate school at Washington State University. I’m an on campus Peace Corps Representative; they gave me my own office and everything!! So stop by if you find yourself in Eastern Washington. Emily, Drina, and I have been adjusting well to northwest life. Em is working at Troy highschool in Troy, Idaho as a school counselor. The kids show up today for their first day of class but she’s been showing up to work for a little over two weeks now. Alright alright, gotta get back to work. Good morning. It’s early and I’m in the capital city of Tegucigalpa finishing up my close of service medical examinations. Over the last month I’ve been in Teguc twice (doubling the amount of times I’ve been here over the past two years) to sign papers and get poked and prodded by doctors and dentists. They’re just making sure I’m in more or less the same condition as when I came down here. Other than a ring on my finger and a few missing pounds I’m pretty much the same, physically anyway. As I mentioned it’s early, I can’t sleep past 530 am in any kind of a city anymore. Cruz Alta is so quiet and the only sounds in the morning are roosters, birds, and an occasional ranchera song turned up too loud. I can’t sleep with the sound of engines with bad mufflers or with no mufflers at all, the constant honking horns, and the shrieking of touchy car alarms. If I could be stealthy and had any mechanical ability at all I’d sneak through the city in the middle of the night, disconnecting car horns and alarms, guaranteeing one morning of solid sleep. I wasn’t paying attention and let a lot of things happen without writing much down. So here I am in July, I just went to my brother’s wedding, I am now married myself, and I have 3 days left of my Peace Corps service. Whew, that’s a lot to cover on a bad cup of coffee and not enough sleep. Here goes. At the end of May Emily and I met up in Tucson to go to my brother’s wedding. The whole thing was beautiful, elegant, and huge. The ceremony was held at a country club outside of Tucson and was very black tie. We wined and dined over six or so courses and had our choice of four bars (including an ice sculpture that they poured martinis down) and several hours devours bars, sushi, lamb chops, the works. I’m pretty sure it was the most well-dressed crowd I’ve ever rubbed shoulders with. But you get a little free booze in the rich people and they’ll make asses of them selves on the dance floor the same as anybody else. Very very cool. 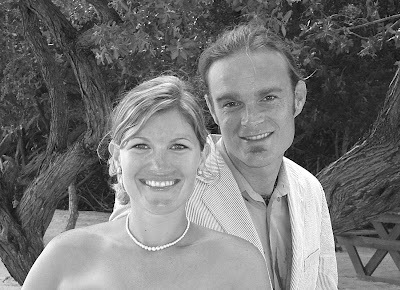 Emily and I were married on June 21st on the island of Utila in Honduras. It was an amazing week. Everything went off without a hitch (something unheard of in Honduras). The wedding ceremony was beautiful; our good friend Connie performed the nuptials. Emily, Connie, and I sat down and wrote our ceremony together using a book of prayer as a guide so it was very personal. 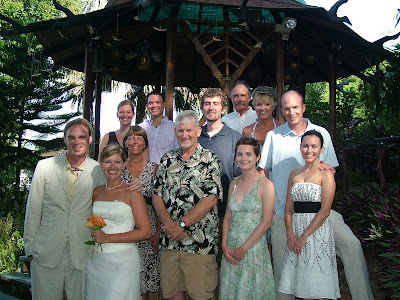 Our ceremony took place at the Jade Seahorse, a hotel on Utila that is completely covered in mosaic and glass art. There is nothing normal about the Seahorse everything on the place is a work of art, down to the toilet paper holders in the bathrooms. We were joined by around 50 of our family members and close friends. I’ll post a few pictures here and if anyone is interested in seeing more of them send me an email and I’ll get you the link. here's another photo of the neighbor kids, Darwin and Melvin hanging out. Here are a couple of pictures of my training group at the beach after our close of service conference. Peace Corps isn't always the toughest job you'll ever love, sometimes its pretty easy. This is a bowl of yuca (a very starchy tuber) soup and a huge stack of tortillas that I ate the other day. I wish I had a frame of reference in the photo but I assure you I ate at least 4 pounds of yuca, this completely screwed up my atkins diet, there's no way I'll be able to fit into my wedding dress now. I'm trying to take a few more every day pictures before I skin out. I have less than two months left as a Peace Corps volunteer. In four days I'll celebrate my 2nd year in Honduras. The strange thing is that I'll be in the States at my brother's wedding the day my second year ends. This is one of the few Pulperias (convenience store with not much but a few bags of chips, some coca cola and soap) we have in Cruz Alta, it is run by a women's bread baking group. There are two wood burning ovens attached to the side of the store. This is the bus from Cruz Alta to Gracias (my closest semi big town). It has been broken down for the last few months and yesterday I took it down to Gracias to run some errands. 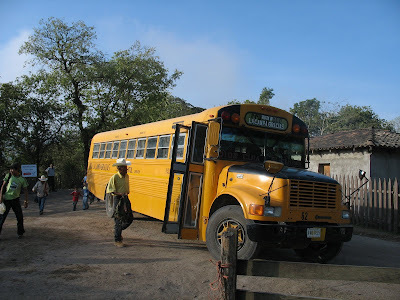 It is strange seeing a decomissioned American school bus in the absolute middle of nowhere Honduras. Darwin, Melvin and I hanging out on my porch. My feet weigh as much as Darwin does. Good morning everyone, I pretty much start every blog with, it has been awhile, I’m sorry for the delay and I promise to do better next time so I’ll skip it for now. Things have been good in site. I’ve been teaching grades seven through nine English and ninth grade everything else. I’m working on a fish pond project. I’ve headed out to my friend Don Pedro Rivera’s coffee finca a few times now scouting a location and we started excavation for his pond last week. It is a bit of a hike to get out to his place, actually more than a bit. It takes me an hour and some change to get to the top of his coffee farm, where we are digging his pond. Tilapia ponds are a good way to supplement the diet’s protein intake. Tilapia require little input and initial investment and are easy to maintain. They grow quickly and can be harvested after six months. They are basically vegetarian and live off the algae that grow in non moving water. Once you have the pond excavated you need to fertilize the water with compost, animal manure, commercial fish feed, or almost anything organic. Once the water is properly fertilized you shouldn’t be able to see your hand if you stick your arm in the water up to your elbow, they like it filthy. It sounds pretty gross but fried tilapia are really, really good, especially with fried plantains. The work is pretty tough. After the hike Don Pedro and I get to work in a muddy, filthy pit filled with huge limestone boulders. We use a pickaxe (piocha) to loosen the rocks and then carry them over to our earthen dam. We use shovels and hoes (palas y asadones) to remove the muck and fling it on the dam. Right now our pond is more or less 4 meters squared and 60 centimeters deep. We are shooting for a depth of a meter, if you go much deeper than that at this altitude the water cools and the tilapia don’t grow. Working with Don Pedro in his finca is always a treat. It is extremely well managed, he has fruit trees, hardwoods, and enormous pines. His finca is full of all kinds of wildlife and beautiful tropical birds and he is eager to point it all out. After working we always head back to his house, covered in muck and completely worn out for a snack or some coffee. Last week his wife gave me a local drink called chilate. It is a hot beverage made from boiled white corn. 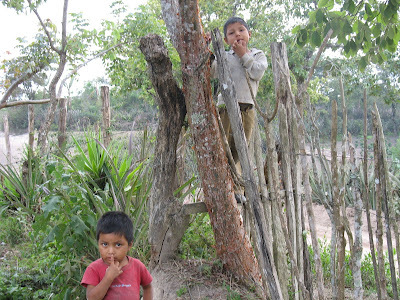 Chilate is typically drunk with a heaping portion of dulce, unrefined sugar from sugar cane. 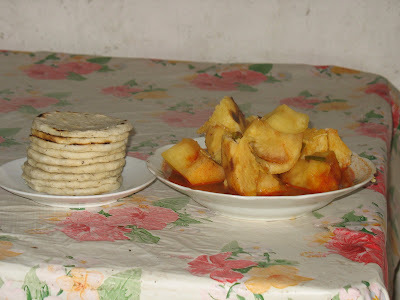 I really like chilate, it is a little bitter, while everything else here has tons of sugar. The dulce was a little rough; it was like eating an entire bowl of brown sugar. When in Rome I guess. Yesterday I spent the day out at Elias’ working on his new house. I spent the day hauling buckets of mud and then using it to set huge adobe bricks. The bricks were heavier than I thought they’d be and by the end of the day I needed some serious hammock time but didn’t get any since I had to head to class. It is pretty neat building an entire house out of the earth. Even the roof tiles will be from fired clay from the area. The only wood we’ll need will be for the eaves, window shutters, and doors. Elias has started talking about wanting to go to the States again. My most memorable moment in service has been the conversation I had with Elias several months back. He constantly was asking me about the US and I would respond that yes the US was fine, but living with your family is more important. After months of discussion he finally told me that his family was more important than money and he really does like his life here. Who wouldn’t? He is living a dream here, not just the American dream but the dream of nearly everyone. He has his health and his family, his own house, and land to plant and crops to reap. 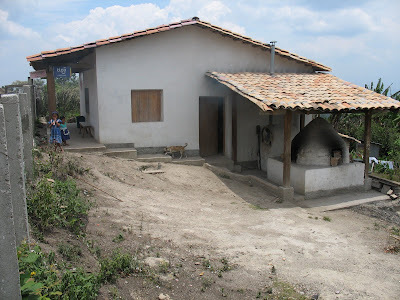 He has a coffee farm, grows beans and maiz, and has fruits and vegetables in abundance year round. He is his own boss. When he’s tired he stops, when he is rested he works. And the greatest of his possessions is the peace that he lives with. People should envy this peace and the time he spends with his family. But he yearns for more. 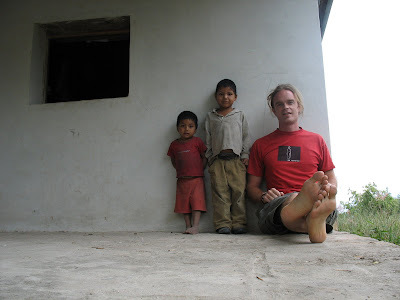 He wants to pay a coyote five thousand dollars to get across Guatemala and Mexico. He’s ready to embark on a long, difficult, and very dangerous journey by train, car and foot. He is willing to be a slave to a fifty or sixty hour work week at minimum wage and to be a nobody. In Cruz Alta he’s already a prominent member of the community, he’s a member of several committees and cooperatives and his opinion is already respected, even though he’s only 26. He wants a television and a car. He wants to pinch pennies and lose at least thirty percent of them to check cashing business and Western Union. I guess I’m upset. I am most upset at the fact that he’s leaving two great sons and a fantastic wife to make it on their own. Far too often (and not just here) we are a generation raised without fathers. In the book Fight Club (it is hard for most people to get past the movie, the chiseled abs of Brad Pitt….but it is an excellent book) Chuck Palahniuk talks about how our fathers are our models for god. What does that say about god when our fathers abandon us? 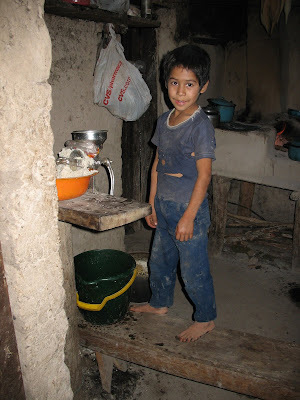 Honduras is full of sons raised by their mothers and the little money their fathers send down. They seek validation from women, thinking that status can be gained by sleeping with many, especially outside of marriage. A man who’s faithful to his wife is not a man; he needs a few viejas on the side. Birth control is not often used and the women are frequently not empowered or educated enough to ask the men to use it. And the cycle continues—more fatherless children. The men in Cruz Alta laugh when I tell them I don’t want a girlfiend here. When I tell them I have a fiancé in the states they tell me “but she’s in the states, you don’t have a girlfriend here.” I am truly blessed to have been raised by fantastic parents. I grew up in a complete household. I can’t thank god or my parents enough. I have an ideal role model in my father. Who works hard and seeks time for family, life, and improvement. I have a mother that has always been there for me no matter how great or small the need and is a model for love and understanding. I am blessed. In three weeks I’ll complete two years living in Honduras and every day I still ask myself why am I here. I’m starting to see that the people in Cruz Alta are better off than most people in the states. They have food on their plates and shelter over their heads. They have more time than most for family and recreation. They may not have cars or designer jeans but if television and NGOs weren’t here to tell them that they’re poor they wouldn’t know it. People like Elias are seeking a standard, a standard that we’ve provided. Electricity came to La Campa (my nearest town) 4 years ago and with it came cable television. Before you got power in your house you had to sign a cable contract. And now I’m starting to see how horrible that really was. The consumer’s dream is everywhere; it is filthy and spreads like disease. I think I’m slowly figuring out why I’m here. I’m not here for development other than for my own. I’m here to find simplicity, and gratefulness for the things I have. I can teach and I can dig fish ponds until my hands bleed and I can’t stand up, and tomorrow I will go. And in a year or so I may or may not be remembered. For the last two years I’ve lived without electricity in a little cement house, I ate simple foods, and people shared with me what they had. I love my family, my soon to be wife, and my friends. They love me in return no matter how far away I am. I love god and nature, to which I belong. I’ve never had to go without. And for all this I am truly thankful, and this is why I’m here.